The most commonly discussed trait of a particular application of radio technology is “the range.” Consumer-marketed walkie-talkies often advertise a “2 mile range” and Wi-Fi range extenders will claim to extend your network by hundreds of feet. The issue exists however, that the distance over which a radio signal is useful is entirely dependent on the nature of the signal, and the nature of the signal’s environment. The process of a signal being spread from it’s transmission point is called propagation. Above are a few common metric prefixes. It is from these that we derive words like kilometer which is 1,000 meters. Note that the green values are getting progressively closer to zero, but never negative. Metric Prefixes are not discussing negative numbers. Within the nature of the signal, the frequency of the wave is the most significant determinant of propagation. We’ve all heard of frequency; when an FM broadcast radio station calls themselves “Extreme 102.1” for example, they’re telling you that they transmit with a frequency of 102.1MHz. 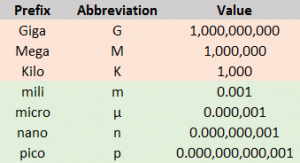 A compound abbreviation exists in the units MHz. The M indicates the metric prefix Mega which is one million times the base unit. Hertz is abbreviated Hz and speaks to the number of cycles of the electrical signal in a second. Thus 102.1MHz simply means 102,100,000 cycles per second. Frequency therefore is measured in cycles per second. Generally it consists of very high numbers. Besides the frequency of the signal, the single most effecting variable is the environment through which a radio signal must travel. In empty space with no obstructions, every radio wave travels equally well at exactly the speed of light. However, when the waves encounter air or a significant obstruction, these idealizations do not completely hold. In fact different frequencies can react very differently to a given obstruction. 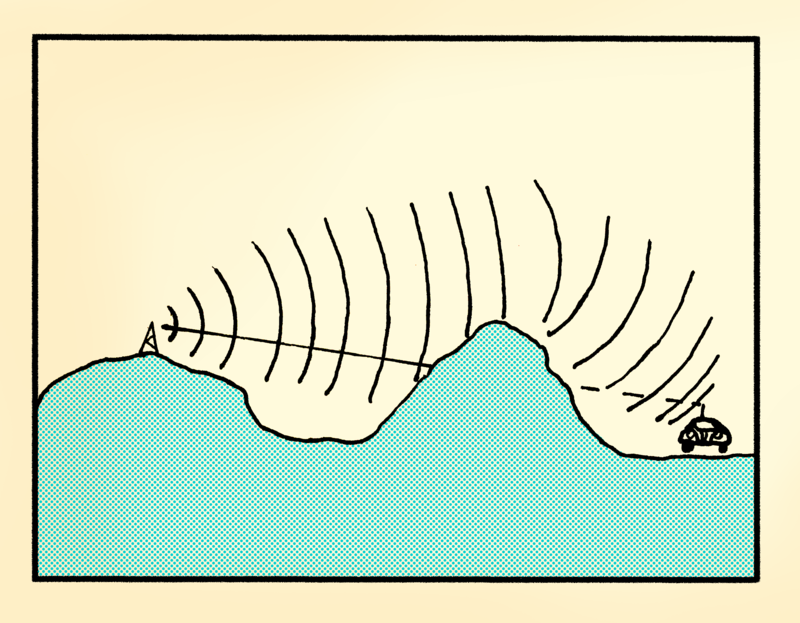 There are three ways that radio waves generally propagate: line-of-sight, diffraction, and reflection. This is the default behavior of all radio waves. Line-of-sight is a very apt name for this method because it simply means “if you can see it, the radio waves can get there.” The highest commonly used frequencies – such as those above 500MHz and up into the GHz range – generally will only propagate via line-of-sight. Though they may pass through an obstruction (such as Wi-Fi from the next room) they become weaker with every hindrance. The main advantage to these frequencies however is that they can carry a large amount of information. 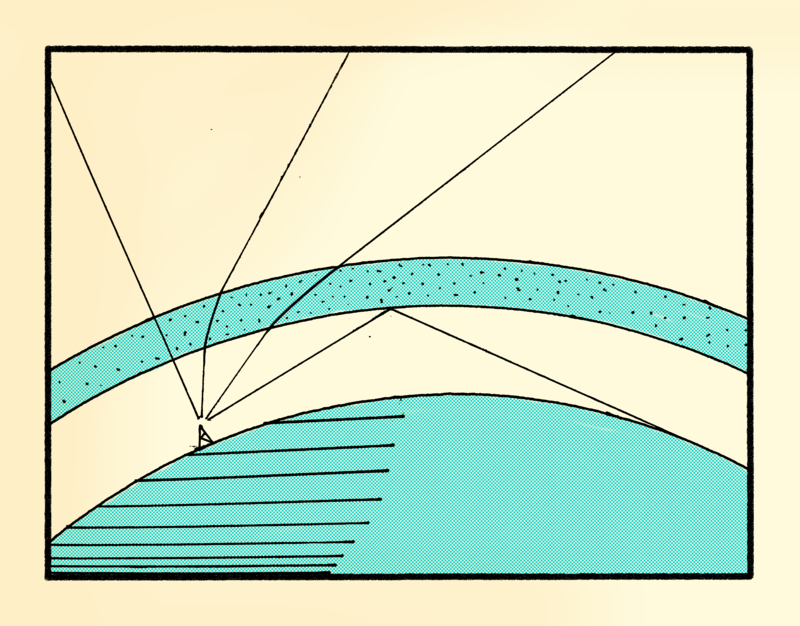 Diffraction allows some signals to “bend over” hills and obstacles thereby reaching receivers that are beyond line-of-sight. This is perhaps the method of propagation with which we are most familiar. 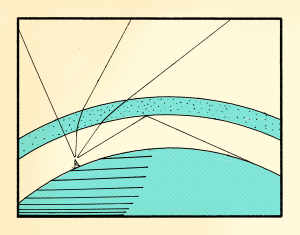 When waves encounter an obstacle, they bend around it somewhat, thereby extending to an area that would otherwise have been out of line-of-sight. 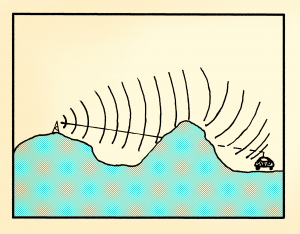 Sound waves do this all the time. This is why you can talk to someone around the corner. It is through diffraction that FM broadcast stations can be heard for miles even when many hills and buildings are in the way. It is the reason that there may not be a cell tower in sight, yet you have one or two bars of service. Radio diffraction is an extremely useful phenomenon that is counted upon by most radio systems. It is the mid-range of frequencies that most often behave in this way. From about 50MHz to 500MHz signals will exhibit useful diffraction and yet be capable of carrying a medium to large amount of information. These frequencies therefore are commonly used for local communications over a region. The ionosphere is a layer of ionized air that surrounds the earth. Some signals pass straight through, and some are refracted and bend somewhat, but signals of sufficiently low frequency and sufficiently shallow angle of attack will reflect back to earth, allowing reception hundreds or thousands of miles away. The third way that radio waves commonly propagate is through reflection. All frequencies will reflect off the right surface. Light (which by the way is the same type of wave as radio) reflects off a white paper or a mirror quite well. In an urban environment reflection of cell signals may give service where line-of-sight and diffraction could not suffice. At low frequencies however, radio waves sometimes reflect off the air in the sky spreading the signal over hundreds and thousands of miles. This is called ionospheric reflection or skywave. By leaving AM broadcast radio to the sports casters and talk show hosts, some of us may not have noticed that at night AM stations can often be heard from across the country. This is skywave at work. When a radio frequency is low enough (generally below 50MHz), and the atmosphere has been significantly ionized, the radio waves will reflect back down to earth. Ionization is the process of splitting molecules into charged particles. The energy from the sun causes this ionization in varying amounts throughout the day, and throughout the sunspot cycle. Skywave is a favorite of Amateur Radio operators and has been a staple method of propagation since radio’s invention. It allows one amateur station on an appropriate frequency to be heard on the opposite side of the continent, and sometimes on the opposite side of the world.